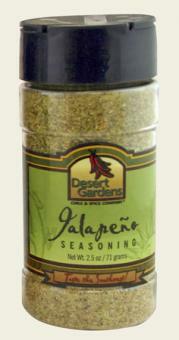 You will love this blend of jalapeno, salt, garlic, and a touch of lime. Spice up vegetables, hamburgers and chicken. Salt, granulated garlic, granulated onion, jalapeno pepper, lime powder. Net Wt. 5.4 oz (154g) shaker. Store in a cool, dry area. Mix with ground beef & grill, sprinkle on eggs, beef, pork or chicken.